Know why MGA Entertainment had been so quiet after the release of Cloud and April? Because they are working in something totally great for all of us. Well, SURPRISE!!! 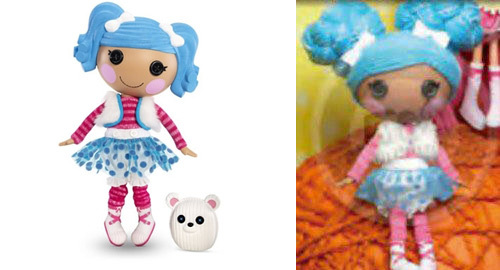 There are lots of new Lalaloopsy dolls for release. We are giving you a blurry preview of these dolls. Hmmm...I guess this is a large doll which is an alien or a martian. Maybe sewn from an alien's clothes? Whatever. With her looks, she really looks like an alien. This is another large doll wearing something like a beaver's costume. 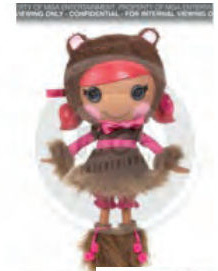 Or maybe she is really beaver or bear inspired with all those brown fur. Excited? Not yet, there are still more! 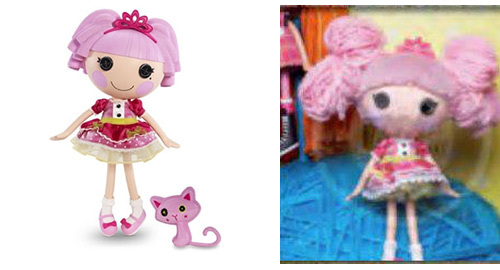 Had you been wishing for a Lalaloopsy with real yarn hair? Your wish came true! 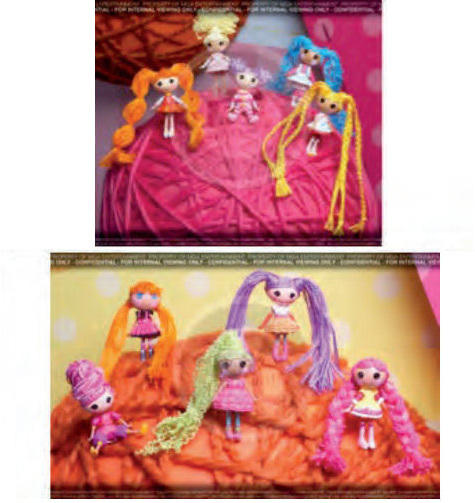 Lalaloopsy dolls with real yarn hairs are coming. We have here are a sneak peek. 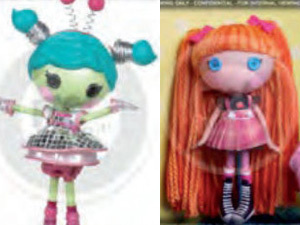 I just included some images of the large dolls so you can see the difference of their hairs. These are sooooo cute!! 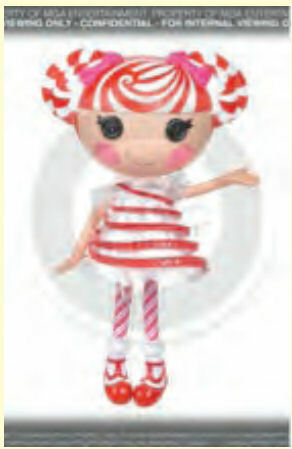 I can't wait to see all these Lalaloopsy dolls with yarn hairs. I think the minis also have them. Look at their hairs, aren't these lovely? I wish they all come with a brush with big bristles so out little loves can comb their hair just like what the Lala-Oopsie horses have with them. Below are upcoming Lalaloopsy factory line. 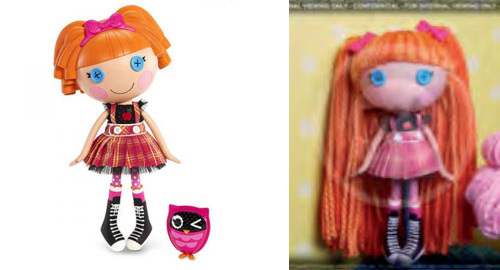 This one is similar to Bratzillaz Switch-A-Witch dolls wherein you can create your own Lalaloopsy doll by combining different dolls. Each dolls, most likely, can be separated into two so you can combine it with another doll thus creating a new one. Oh well, oh well...let us just wait for these dolls to come out. 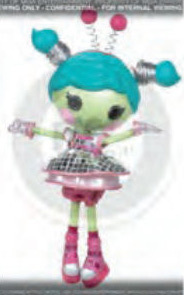 So many new Lalaloopsy dolls are coming! For sure you are sew excited! Which of these three sets of releases excite you the most? 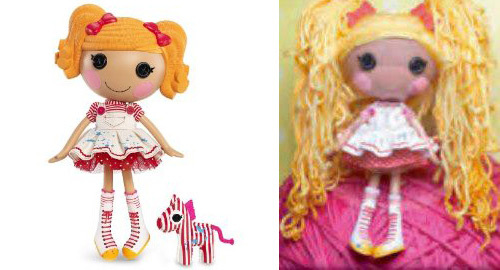 The Lalaloopsy with real yarn hairs, the new large dolls or the new line of Lalaloopsy? Keep posted with Lalaloopsy updates. Like us in Facebook.